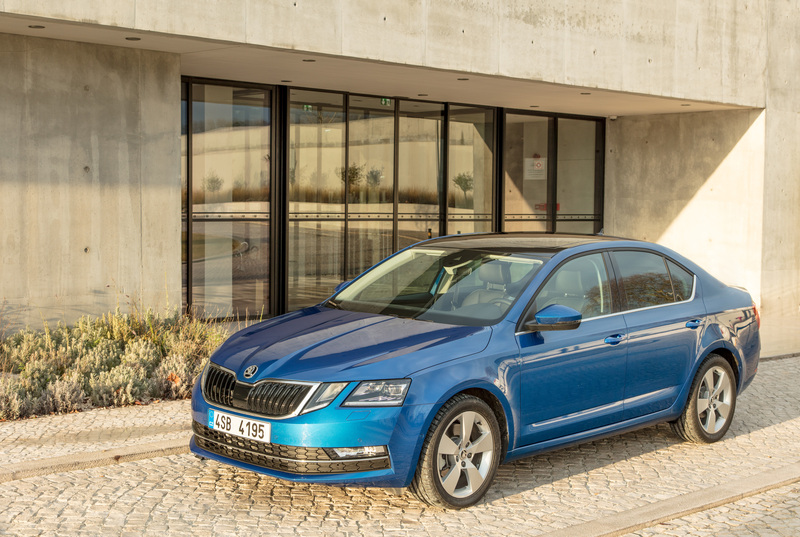 Mladá Boleslav / Porto, 6th February 2017 – The ŠKODA OCTAVIA begins the third decade of its success story with proven strengths and new qualities. 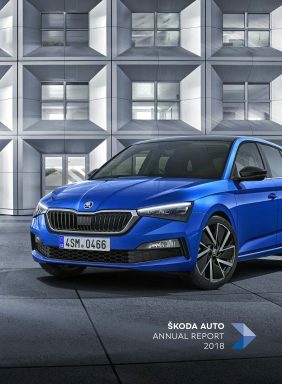 Comprehensive revisions give the Czech car manufacturer’s bestseller a particularly striking design, a refined ambiance in the familiar generously sized interior and optimised driving characteristics. Nine engines, including a CNG variant, are available for the ŠKODA OCTAVIA and ŠKODA OCTAVIA COMBI. When coupled with the 110 kW (150 PS) TDI engine, the optional 7-speed DSG gearbox can also be combined with all-wheel drive for the first time. 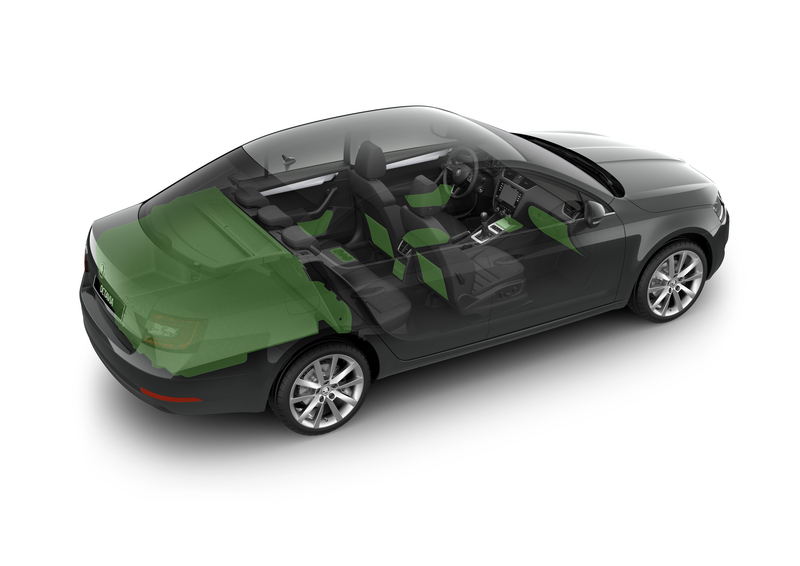 Dynamic Chassis Control is available and the range of driver assistance systems has also been extended. 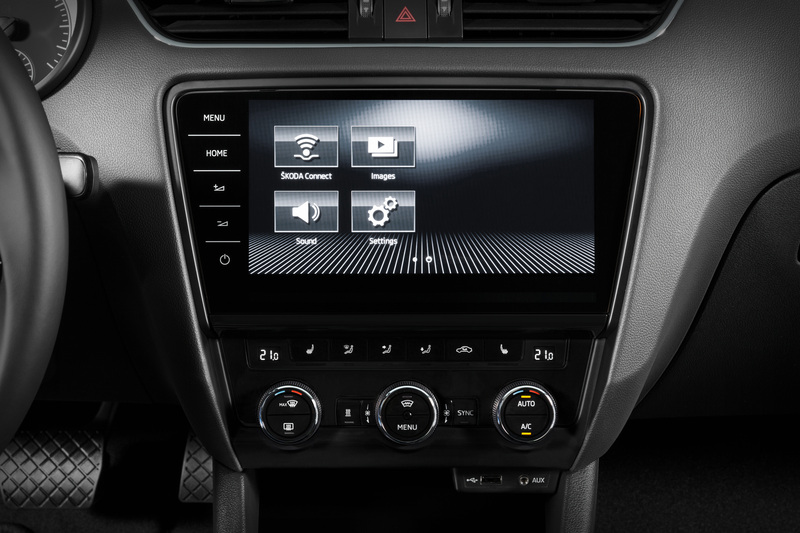 A new generation of infotainment systems enables the use of the ŠKODA Connect online services. 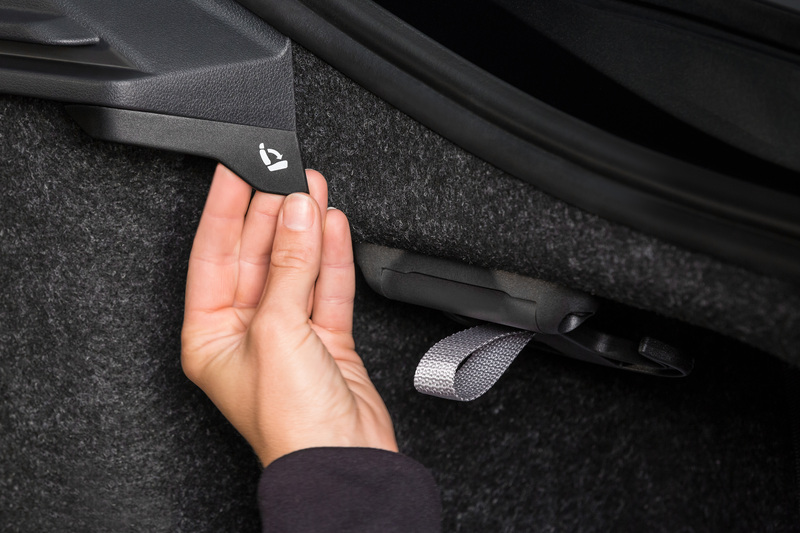 The upgrade of the compact car segment models is completed by additional ‘Simply Clever’ features. 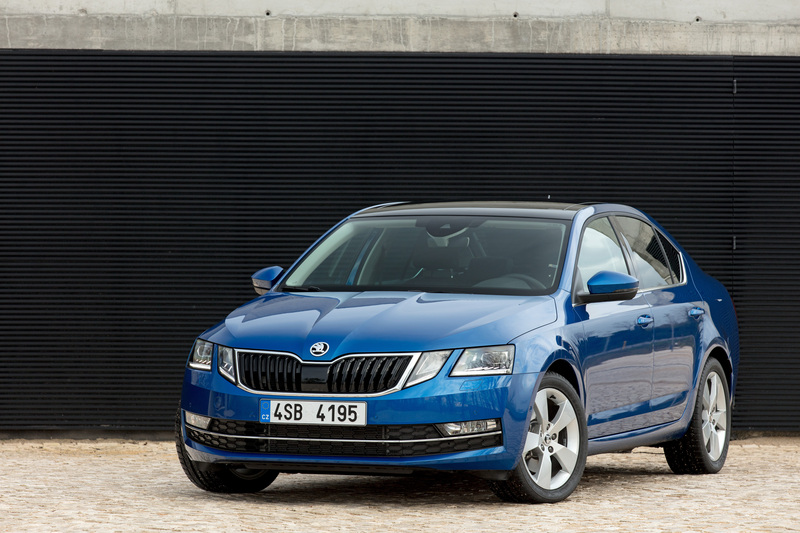 The ŠKODA OCTAVIA and ŠKODA OCTAVIA COMBI combine the typical strengths of the brand and contribute considerably to the Czech car manufacturer’s growth with more than 5 million cars sold to date. Following its comprehensive revisions, the third generation of the model that was originally introduced in 1996 once again presents itself in top shape, both visually and in terms of technology. 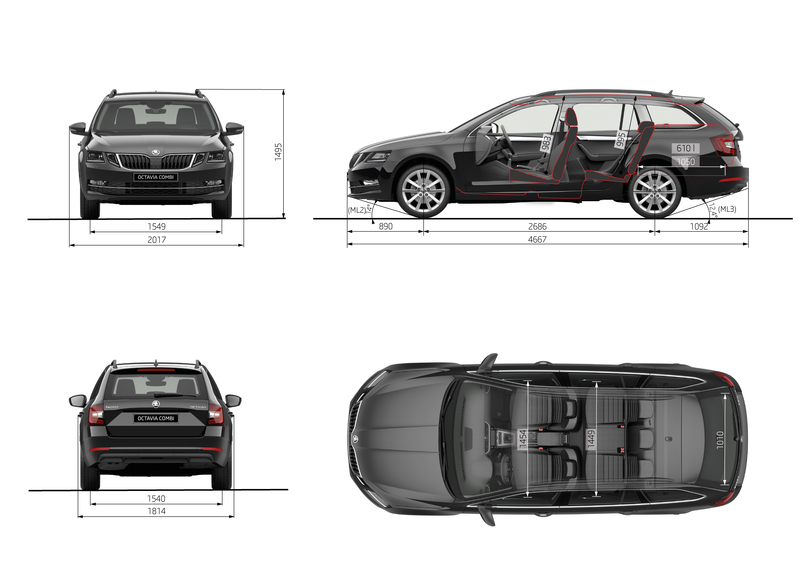 In addition to its larger-than-average interior and its exceptional value for money, the ŠKODA OCTAVIA now offers even more of the safety and comfort features found in higher segments, strengthening its excellent position within the compact car segment. 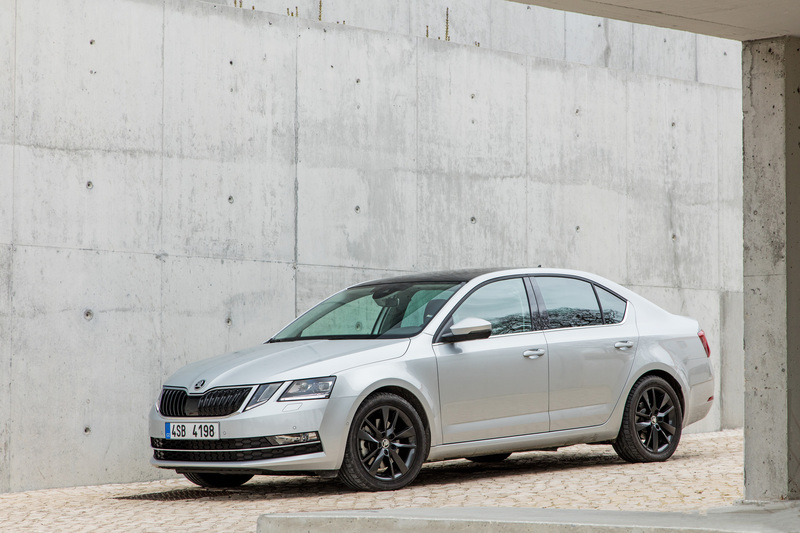 The design modifications made as part of the comprehensive model upgrade give the ŠKODA OCTAVIA and ŠKODA OCTAVIA COMBI a distinctive appearance, characterised in particular by the front section with its wide radiator grille. Additional lighting units within the headlights, with a crystalline look, and wider honeycomb air inlets provide them with more of a presence and create a masculine, dynamic and emotive overall impression. The outer headlights produce the dipped beam and the high beam shines from the inner headlights, tapered towards the radiator grille. Newly developed full-LED headlights are available from the Ambition trim level upwards. 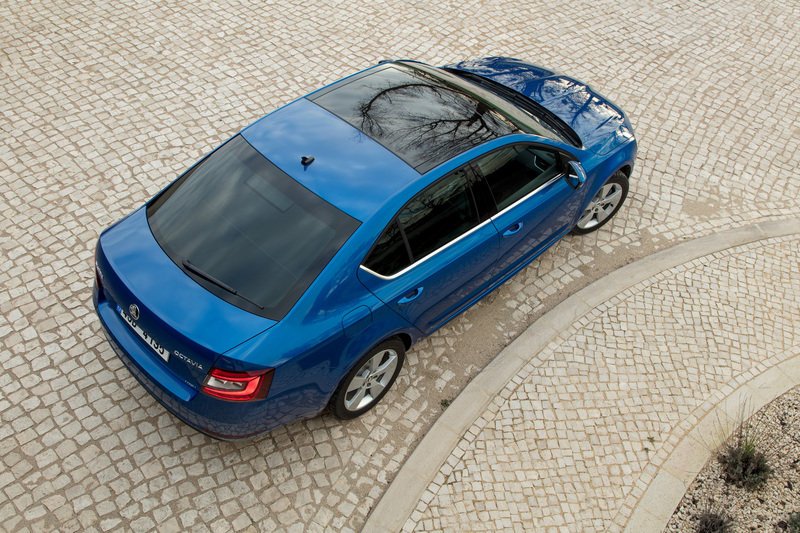 The side view of the ŠKODA OCTAVIA and ŠKODA OCTAVIA COMBI is characterised by precise and clean-cut lines leading all the way to the rear section. 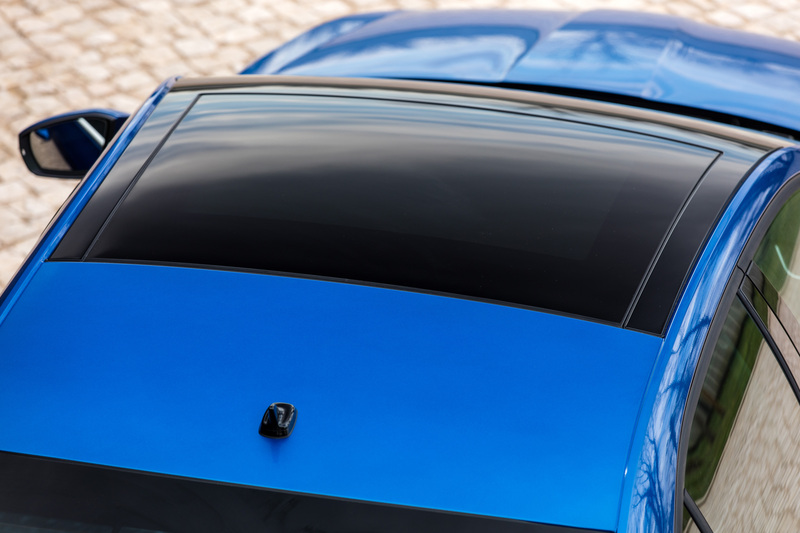 The redesigned rear bumper appears powerful and bold with its subtle contours. The use of LED technology for the rear light cluster lends the characteristic C-shaped tail light the appearance of a homogeneous lighting surface. As part of the model upgrade, the outer dimensions of the ŠKODA OCTAVIA and ŠKODA OCTAVIA COMBI have changed slightly. 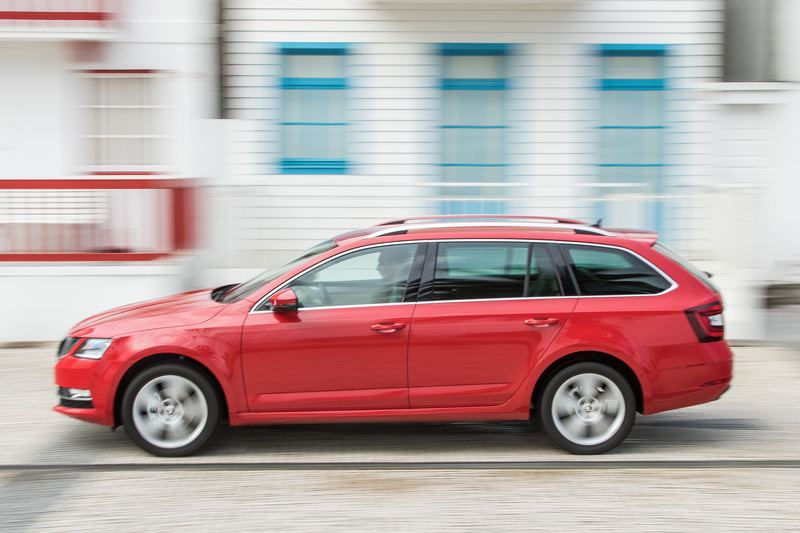 The hatchback has grown in length by 11 mm to 4,670 mm; the estate has grown by 8 mm to 4,667 mm. The rear track is 20 or 30 mm longer, depending on the engine variant. The wheelbase, which remains at 2,686 mm, is unusually long for a vehicle in the compact car segment. 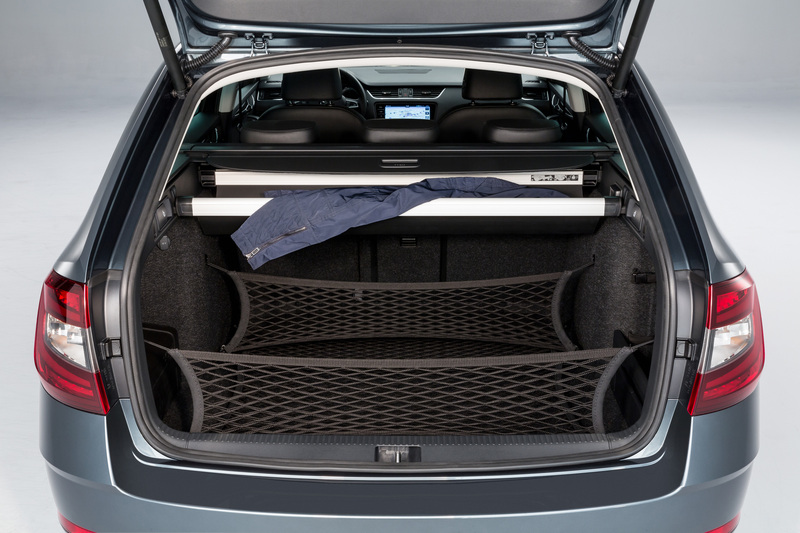 From these outer dimensions, ŠKODA engineers have created an interior where the amount of space for passengers and luggage far exceeds the usual dimensions found in this segment. 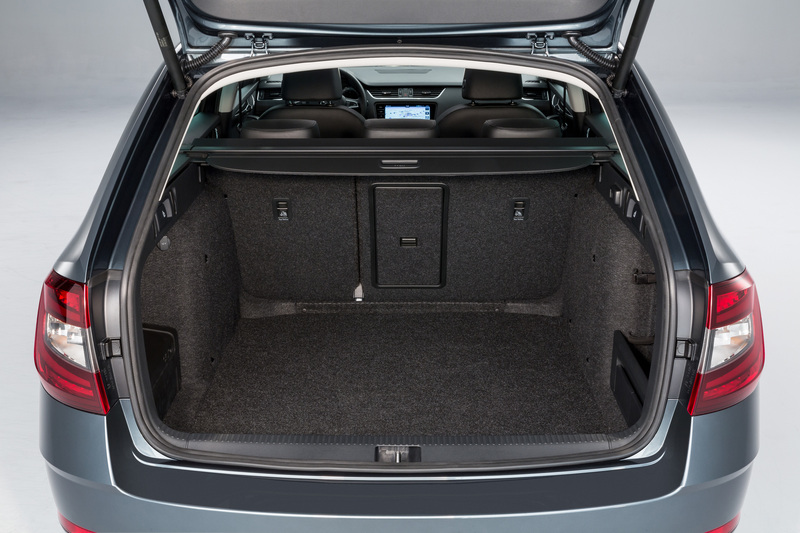 Occupants enjoy generous, leg-, elbow and headroom in the front and rear. 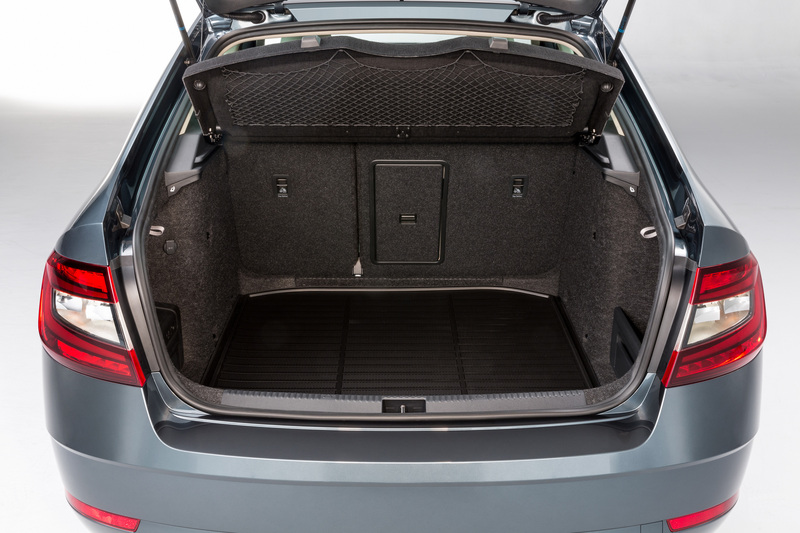 The boot capacity of the hatchback, which has a large tailgate hinged at the roof, is 590 l (1,580 l with the rear seats folded down). 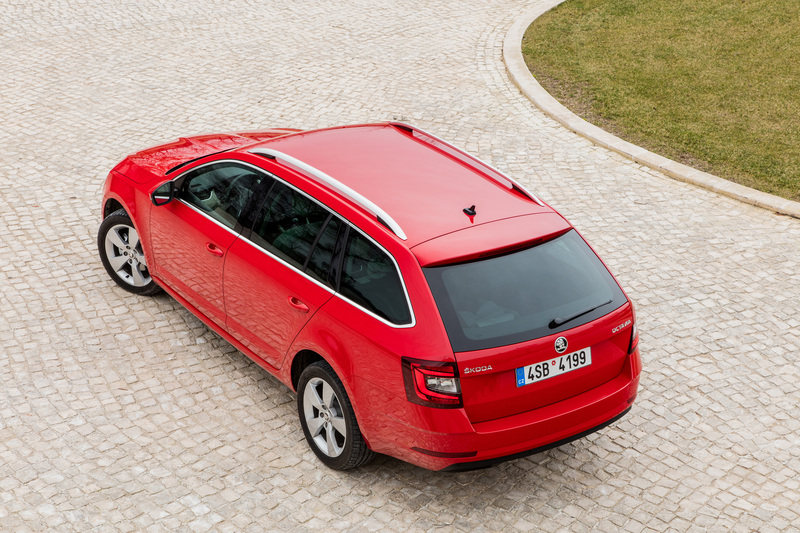 In the estate, it is a whopping 610 l, which can be expanded to up to 1,740 l if necessary. 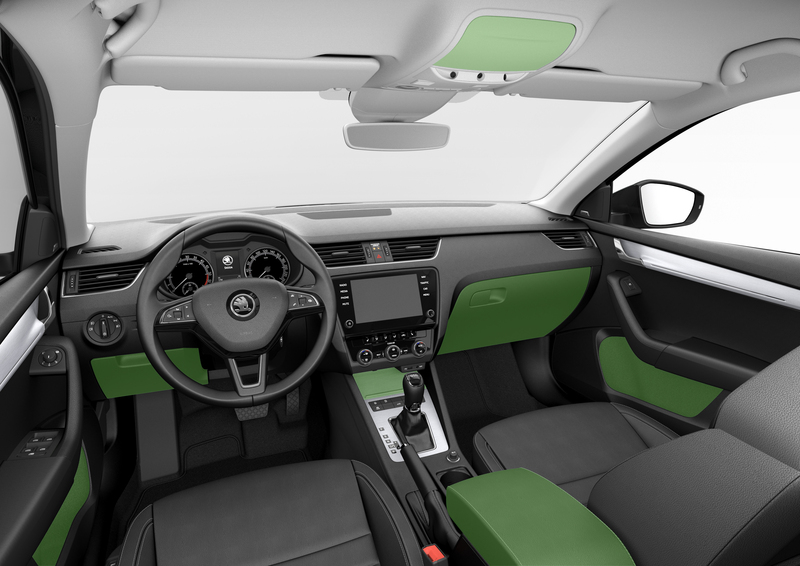 The interior of the ŠKODA OCTAVIA and ŠKODA OCTAVIA COMBI impresses not only with its generous dimensions and great clarity, but also with its high-quality materials and new features. The revised multifunction displays are clear and easy to read. 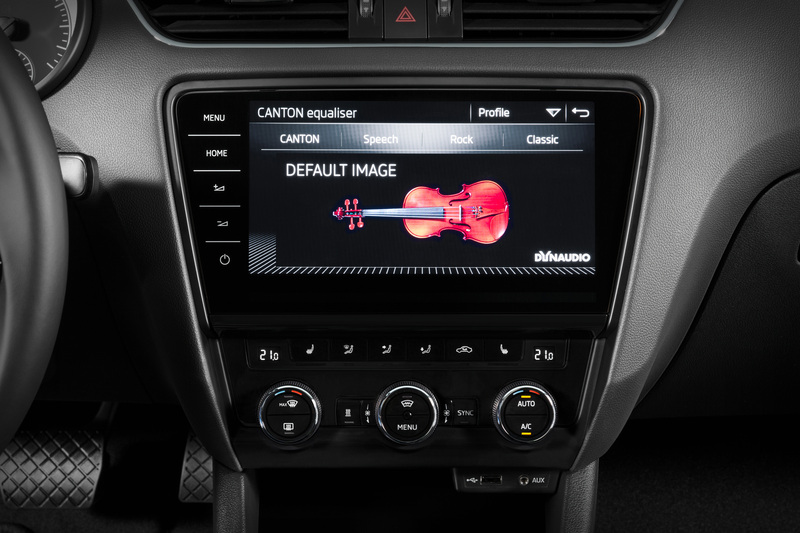 The type of information displayed on their screen varies according to the trim level. The air conditioning controls have also been visually refined. 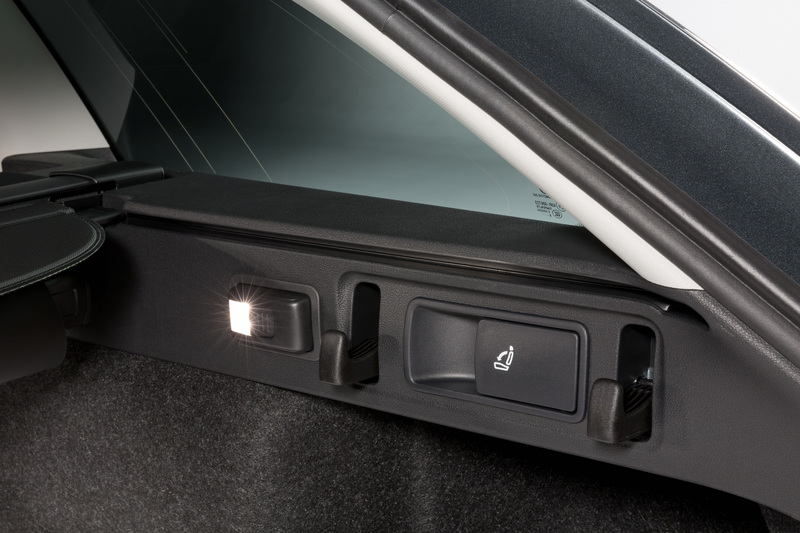 The door trims are now available with additional ambient lighting as an option. Slim LED lighting units at the upper edge of the trim strips emit a discreet, atmospheric light which can be set to one of ten different colours. 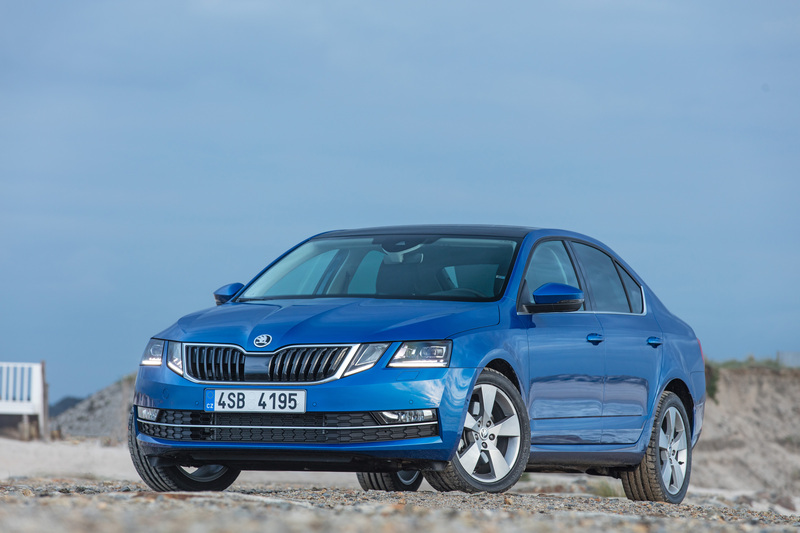 The revised ŠKODA OCTAVIA and ŠKODA OCTAVIA COMBI models are launched with a choice of nine engines: four TSI petrol, four TDI diesel and one CNG engine. The power outputs range from 63 kW (86 PS) to 135 kW (184 PS). The modern drivetrains contribute to the fact that all of the compact car’s variants have a good balance of driving performance, consumption and emissions. They feature a manual gearbox with 5 or 6 speeds or automatic DSG gearboxes with 6 or 7 speeds. The TSI engines have a turbocharger and direct petrol injection. The 1.2-l TSI engine with four cylinders and a power output of 63 kW (86 PS) is the entry-level variant and is combined with a 5-speed manual gearbox. The engine with the smallest capacity in the range has a power output of 85 kW (115 PS). 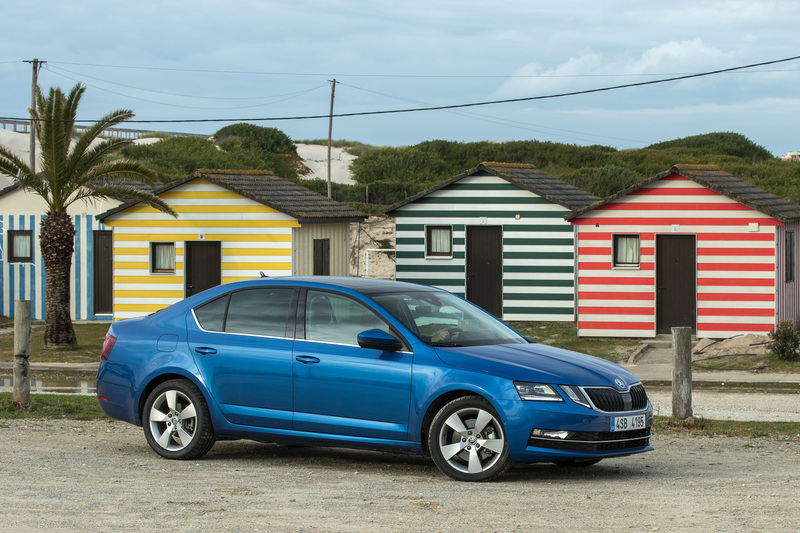 The 1.0-l TSI engine with three cylinders is available with a 6-speed manual or a 7-speed DSG gearbox. The 1.4-l TSI G-TEC engine is a particularly efficient variant which, as a bivalent engine, can run on both CNG and petrol, and offers a power output of 81 kW (110 PS). 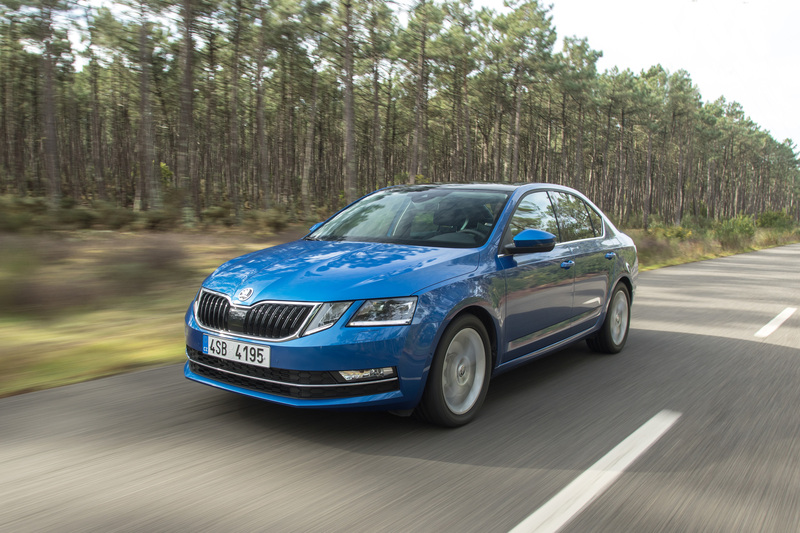 In CNG drive and when combined with the 7-speed DSG, the ŠKODA OCTAVIA and ŠKODA OCTAVIA COMBI have CO2 emissions of 98 and 99 g/km respectively with this engine. 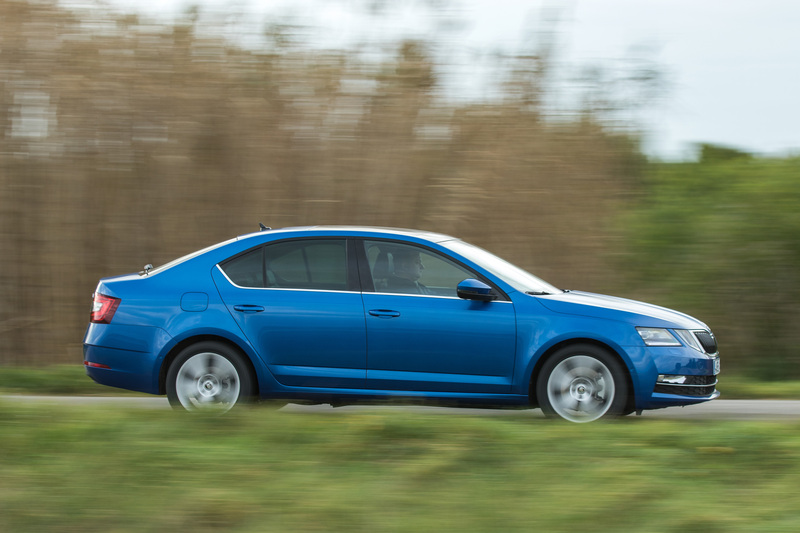 As a pure petrol engine, the 1.4-l TSI produces 110 kW (150 PS). 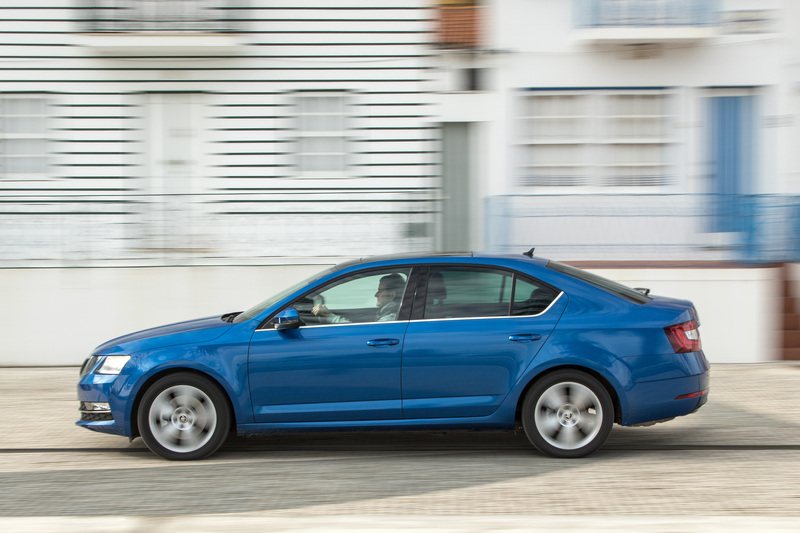 The 1.8-l TSI engine is the top-performing petrol engine with a power output of 132 kW (180 PS). 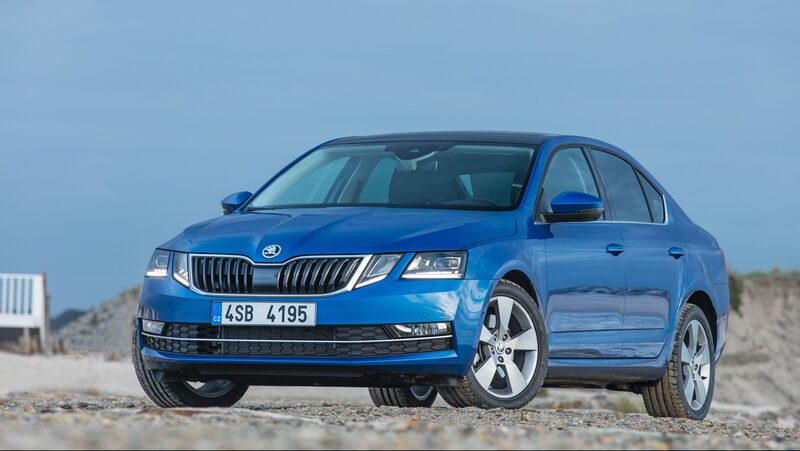 Turbocharging and high-pressure direct injection with Common rail technology are features shared by the TDI engines for the ŠKODA OCTAVIA and the ŠKODA OCTAVIA COMBI. Both four-cylinder engines with a capacity of 1.6 and 2.0 l respectively are available with two performance levels. 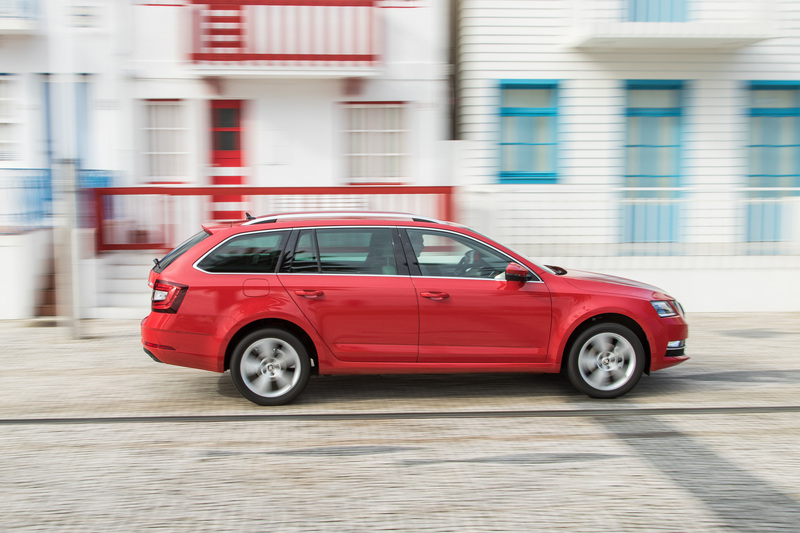 The entry-level 1.6-l TDI engine provides 66 kW (90 PS) and is combined with a 5-speed manual gearbox. A 7-speed DSG is available as an alternative to the manual gearbox for the second variant of the 1.6-l diesel engine, which now has a power output of 85 kW (115 PS). 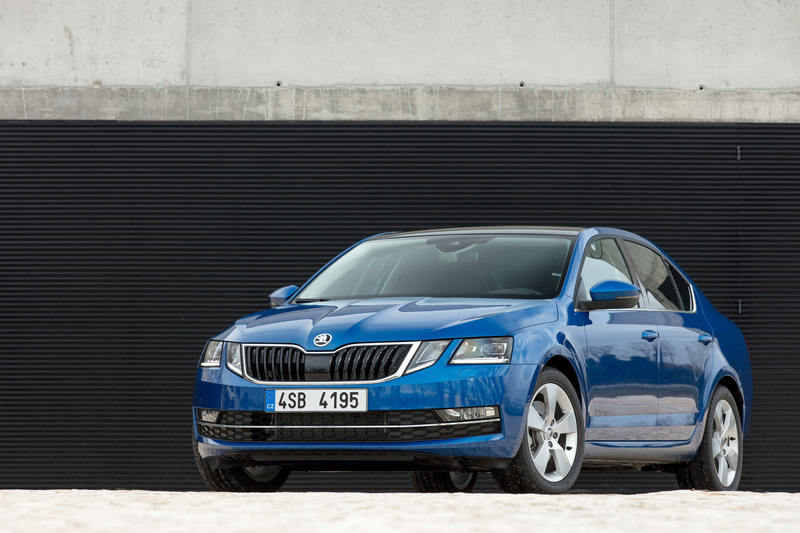 In this combination, the combined fuel consumption of the ŠKODA OCTAVIA and ŠKODA OCTAVIA COMBI totals just 3.9 l/100 km. 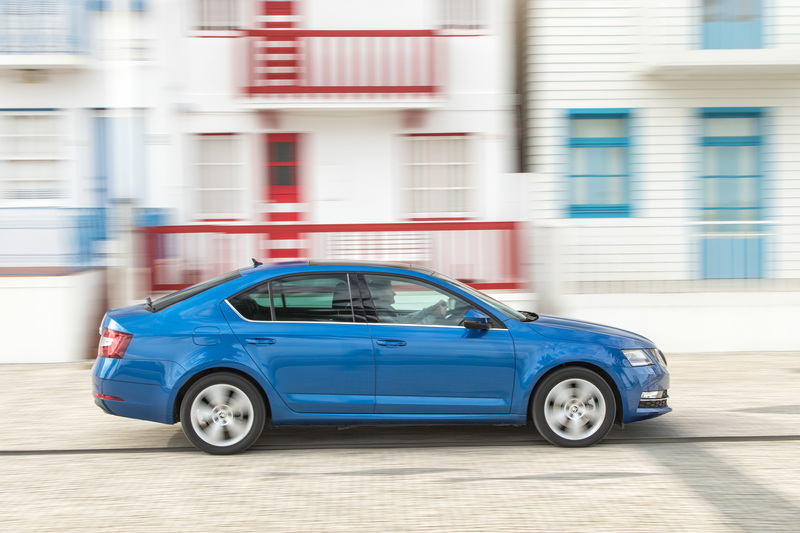 The two 2.0-l variants of the TDI engine offer power outputs of 110 kW (150 PS) and 135 kW (184 PS). The 110 kW (150 PS) diesel engine comes with a 6-speed manual transmission and is available both with front- and all-wheel drive. 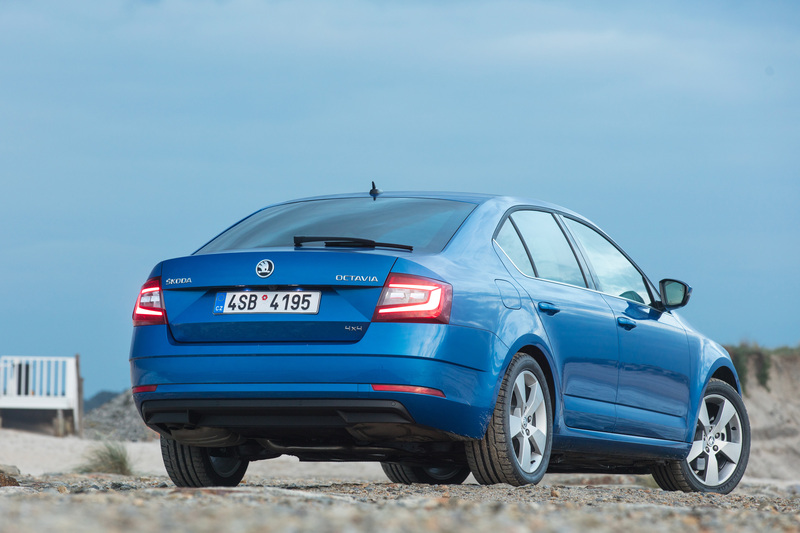 A 6-speed DSG is available as an alternative for front-wheel-drive models; a 7-speed DSG is available as an option for the first time in a ŠKODA OCTAVIA with all-wheel drive. 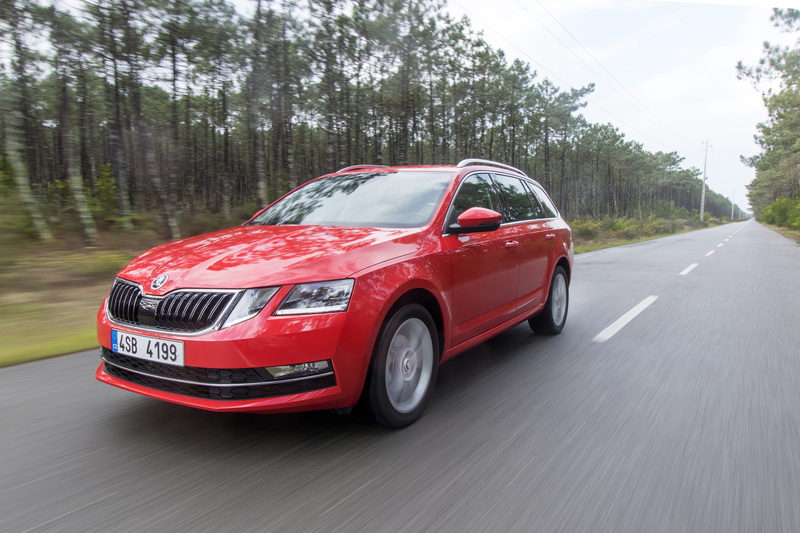 The most powerful diesel engine is only available with all-wheel drive. A 6-speed DSG is also part of the standard equipment for this model variant. The 1.8-l petrol engine with 132 kW (180 PS) is the third engine that can be combined with all-wheel drive. 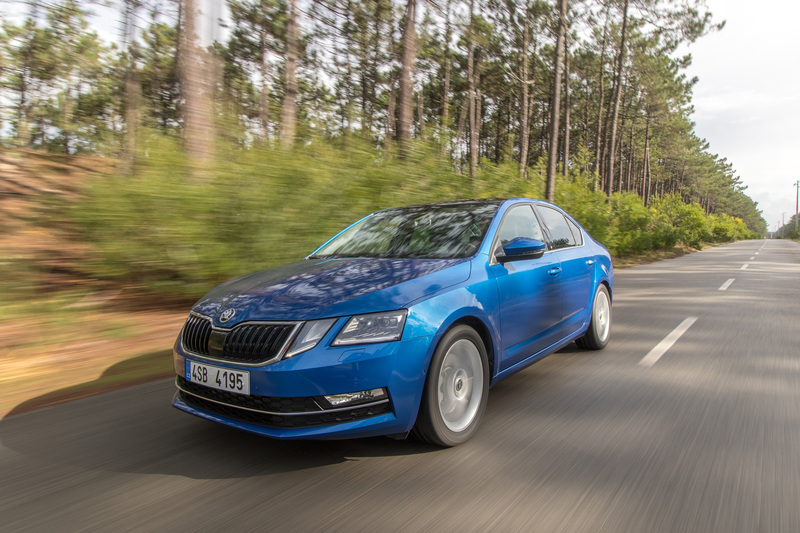 The all-wheel drive system that provides the decisive increase in traction and safety in the ŠKODA OCTAVIA and ŠKODA OCTAVIA COMBI has a compact design and low weight. A key component of the system is an electronically controlled multi-plate clutch, which is located in front of the rear axle. 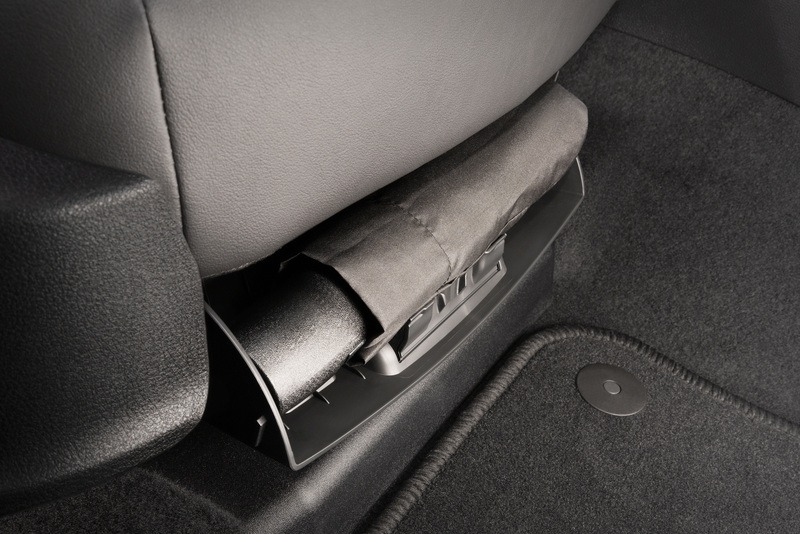 The system’s control unit constantly calculates the ideal driving torque for the rear axle. Based on this, appropriate power distribution to the four wheels is maintained at all times for any situation. The XDS+ electronic differential lock, a function of the Electronic Stabilisation Control (ESC), makes handling even safer when cornering quickly – in both front-wheel-drive and all-wheel-drive versions. XDS+ gently slows down the inner wheels to transmit more power to the outer wheels. 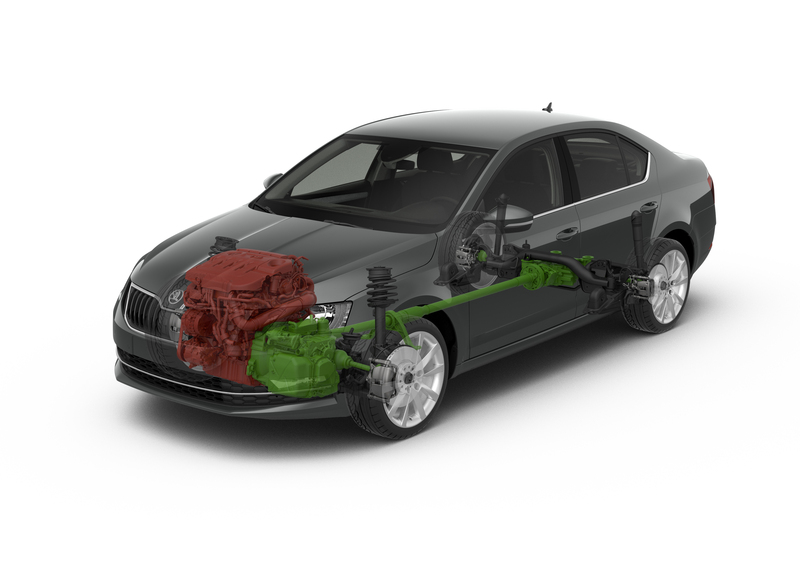 The chassis technology of the ŠKODA OCTAVIA and ŠKODA OCTAVIA COMBI includes a MacPherson design with lower triangular wishbones on the front axle and, depending on engine variant, a multi-link or four-link rear axle. As part of the model upgrade, the rear track has been widened by 20 and 30 mm respectively. The rack-and-pinion steering uses an efficient electro-mechanical servo drive, which also enables interaction with numerous assistance systems. Large brakes ensure reliable deceleration. 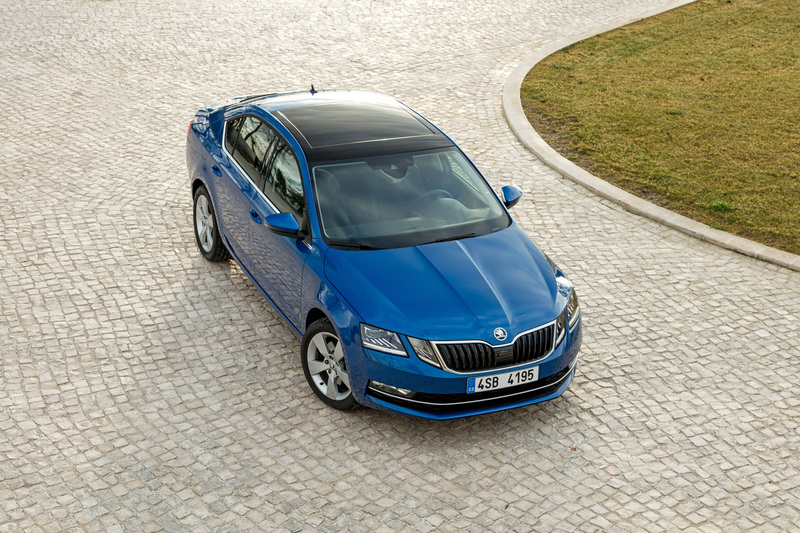 Adaptive Dynamic Chassis Control (DCC) is available for the ŠKODA OCTAVIA and ŠKODA OCTAVIA COMBI as an option. With this system, the way the dampers work is controlled using electrically operated valves. It can be adjusted to three modes, Comfort, Normal and Sport, which can be selected by the driver. 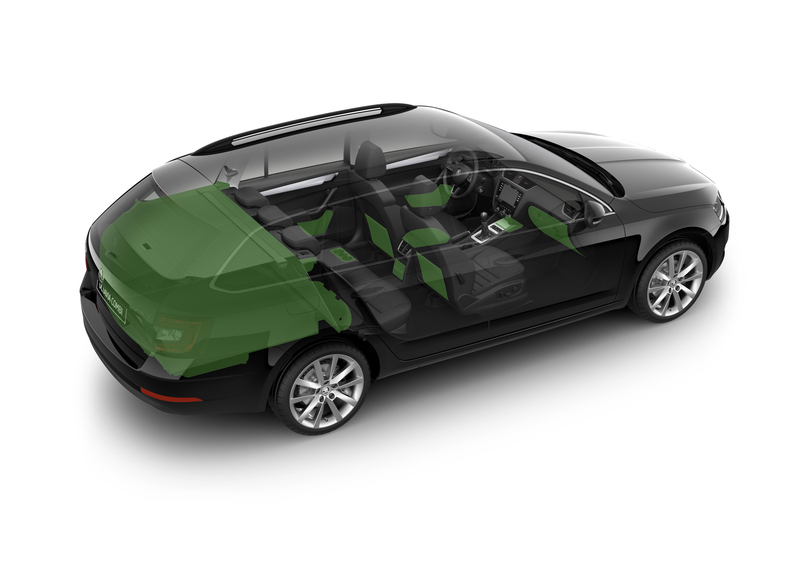 DCC also contributes to active safety by automatically switching to Sport mode in dangerous situations to provide greater stability, better tyre grip and shorter braking distances. DCC is available from the Ambition trim level upwards (not available for engines with a power output of less than 110 kW / 150 PS). With Driving Mode Select, the driver can change the steering characteristics, the operation of the DSG transmission, and the settings of other functions. There is a choice of Normal, Eco, Sport and Individual settings, and even a Comfort mode with Dynamic Chassis Control. 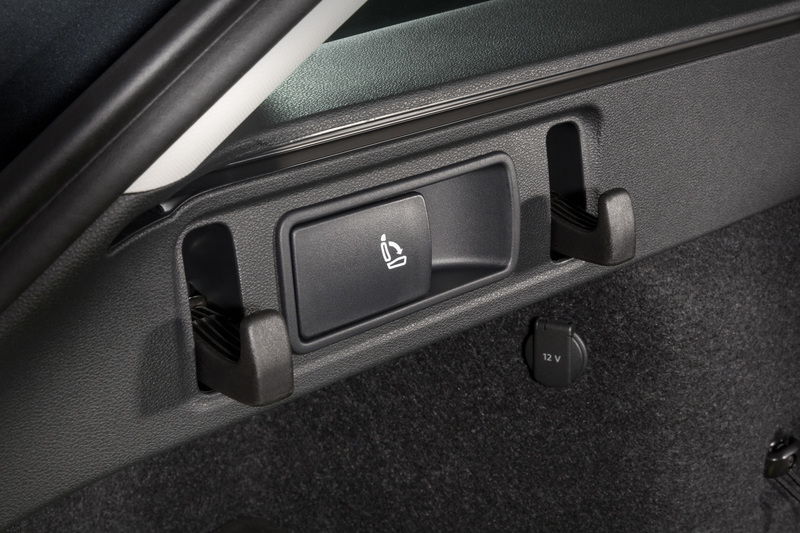 The individually selected configurations can be saved on the personalisable key, which is available is an option. 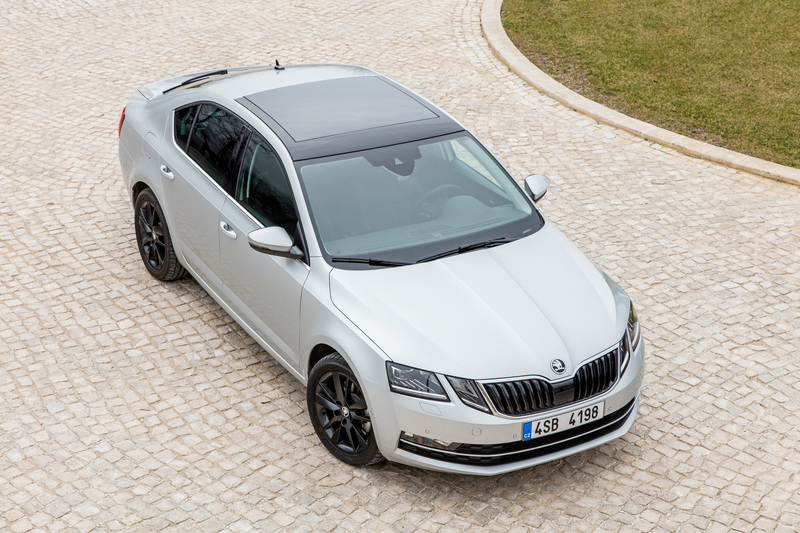 Five new features have been added to the range of driver assistance systems for the ŠKODA OCTAVIA and ŠKODA OCTAVIA COMBI as part of the model upgrade. They optimise safety when driving in city traffic, on country roads and on motorways, and provide additional comfort when parking and manoeuvring. 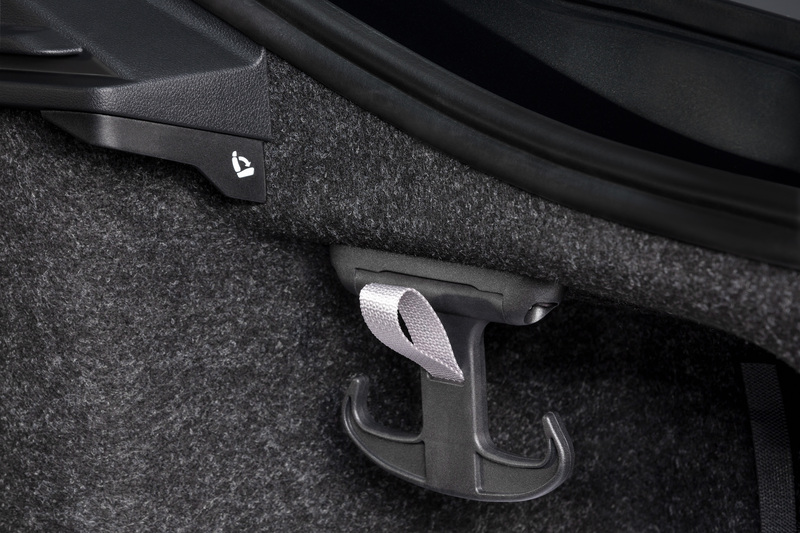 The optional Front Assist with City Emergency Brake function also includes Predictive Pedestrian Protection. The system works using radar sensors and now also reacts to pedestrians crossing the road. This function is active between 10 and 60 km/h. Between these speeds, the system performs an emergency stop in the event of an impending collision and helps to prevent an accident or at least drastically reduce the consequences of the accident. 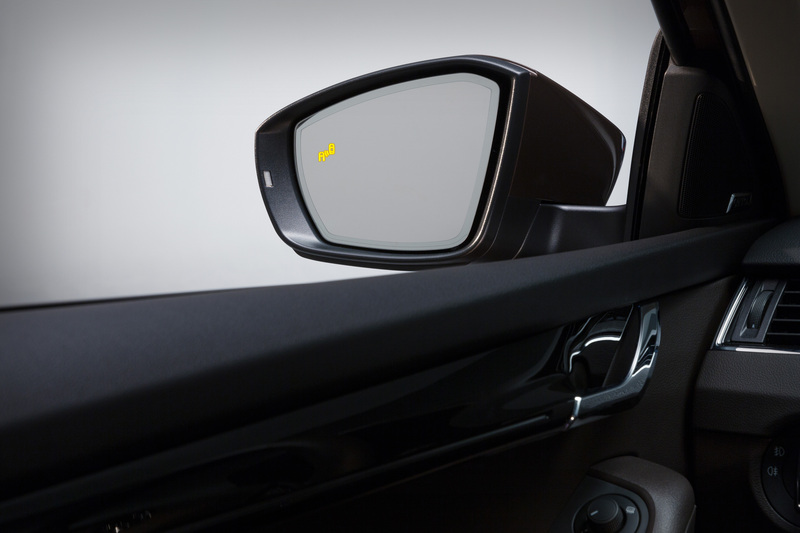 The new Blind Spot Detect feature contributes to safety when changing lanes on multi-lane roads. It can be used between 10 km/h and the top speed. Two radar sensors at the rear monitor traffic coming from behind. If another vehicle rapidly approaches from behind or is in the blind spot, a warning LED light illuminates in the corresponding wing mirror. The radar sensors at the rear are also used by Rear Traffic Alert, another new feature which assists the driver when reversing out of parking spaces or driveways. 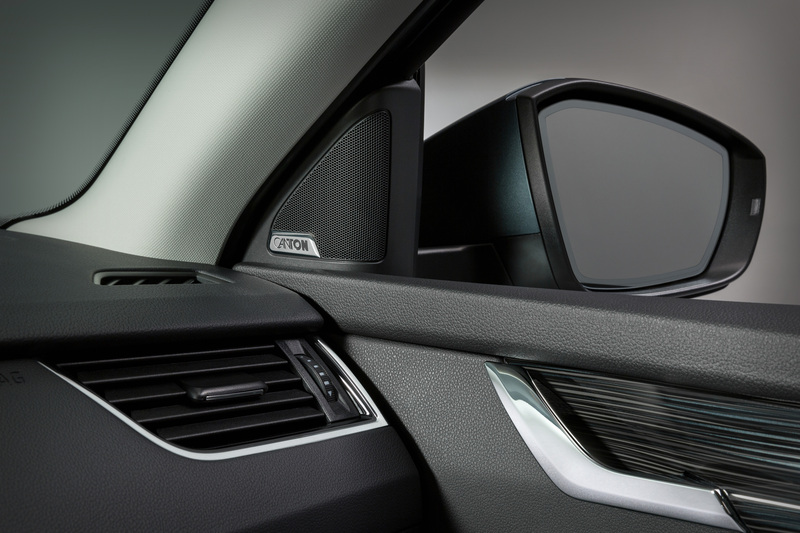 It detects passing traffic very early on, and warns the driver first visually, then acoustically, and finally with automatic braking if necessary. 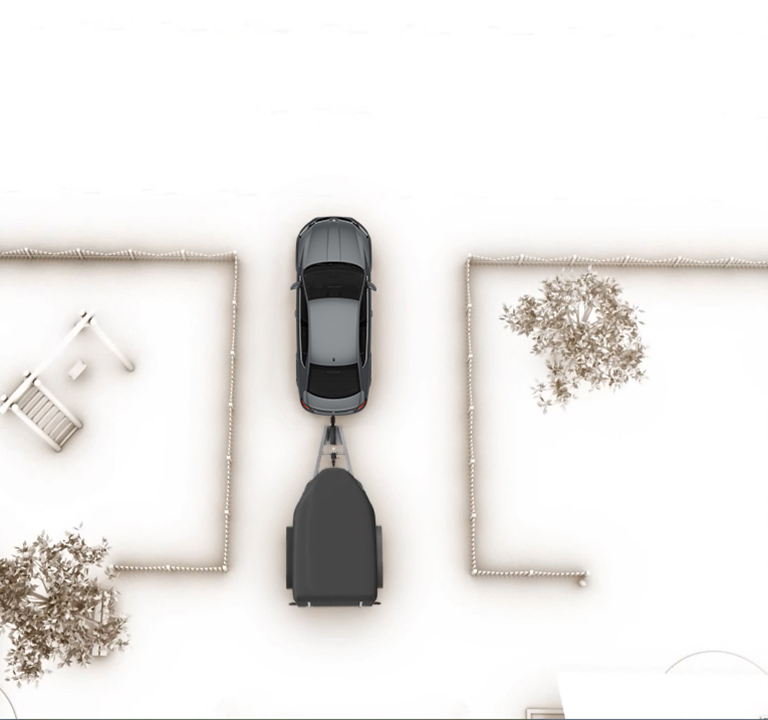 The optional Trailer Assist transforms even those with little towing experience into experts. 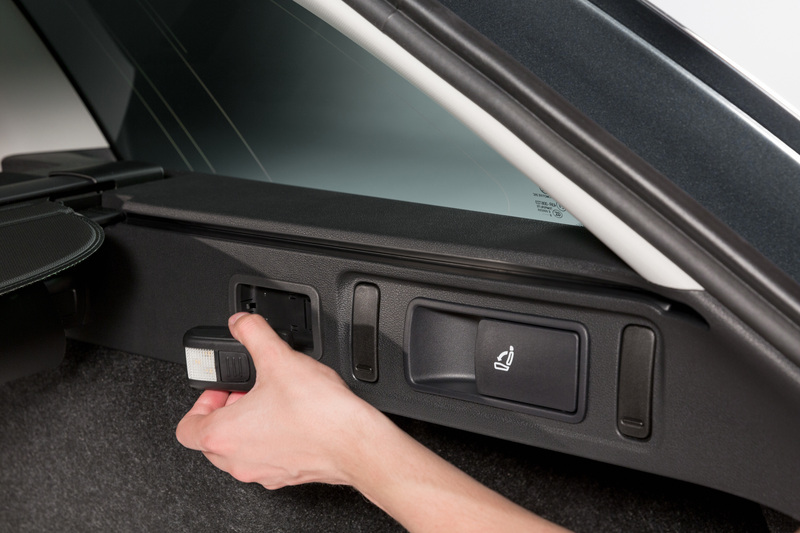 To make use of this feature, the driver has to engage reverse gear and press the park button. The driver then uses the turn-switch for the wing mirrors to set the angle they would like to use for reversing. For guidance, the image on the in-car monitor displays a diagram showing the turning angle of the trailer. 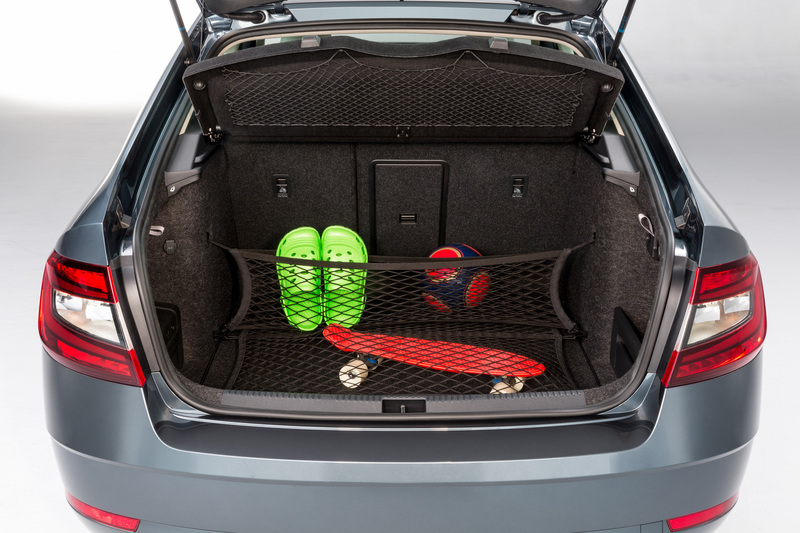 The driver then only has to accelerate gently – the system steers the car and trailer automatically at the chosen angle. 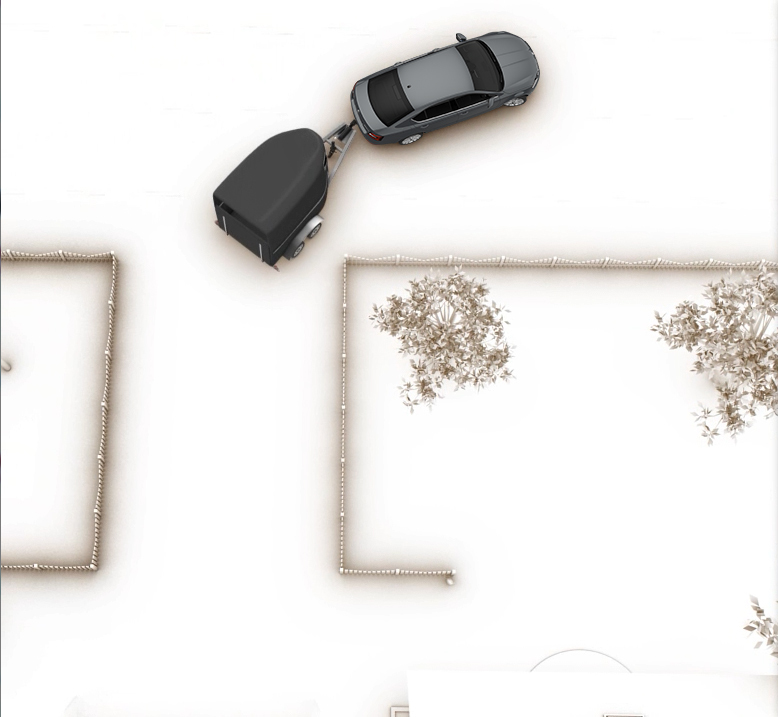 Manoeuvre Assist, another new feature, offers assistance when reversing without a trailer by braking the vehicle automatically as soon as it detects an obstacle behind it thanks to the rear parking sensors. 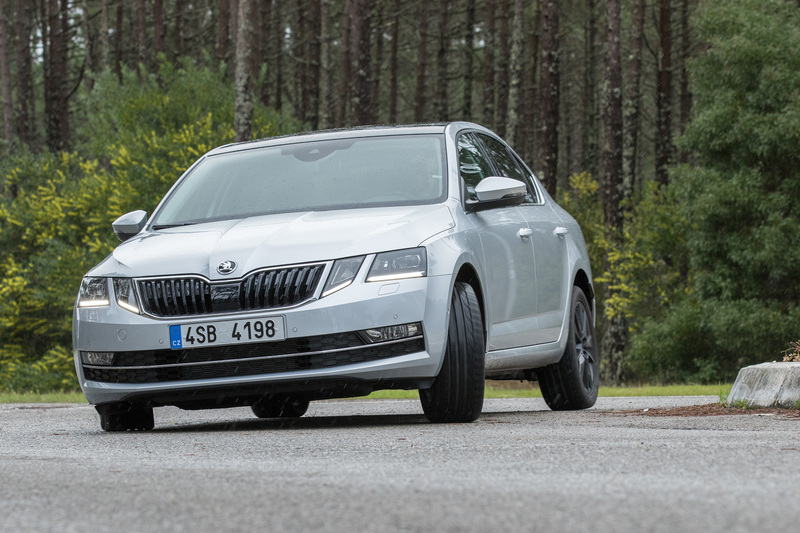 The new features supplement the range of driver assistance systems that were already available before the ŠKODA OCTAVIA and ŠKODA OCTAVIA COMBI model upgrade. These include the radar-based Adaptive Cruise Control (ACC), which maintains the speed selected by the driver and the ideal gap from the vehicle in front, Lane Assist, which warns the driver should the vehicle unintentionally deviate from its lane, the fatigue detection feature Driver Alert, and the proactive occupant protection feature Crew Protect Assist, which initiates safety precautions in the event of an impending collision. In addition, Auto Light Assist, the camera-based Travel Assist with Traffic Sign Recognition, Park Assist and a rear-view camera are also available. 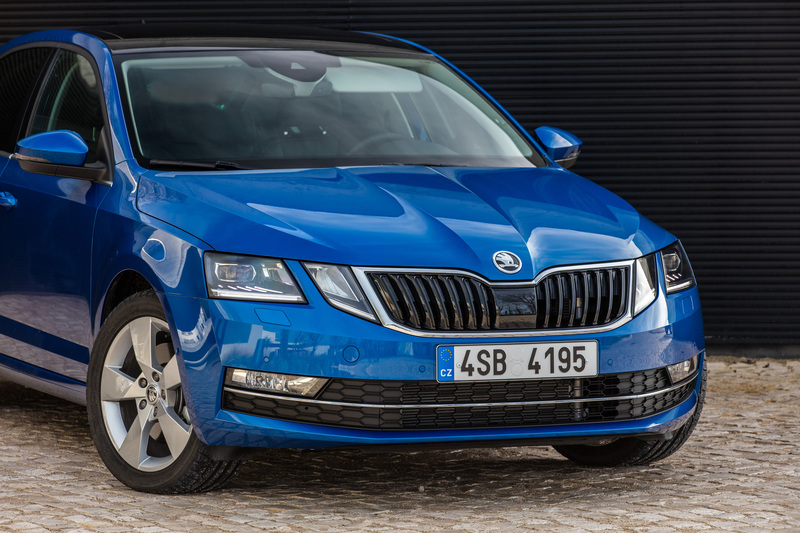 The infotainment systems found in the comprehensively revised ŠKODA OCTAVIA and ŠKODA OCTAVIA COMBI models belong to a new generation. 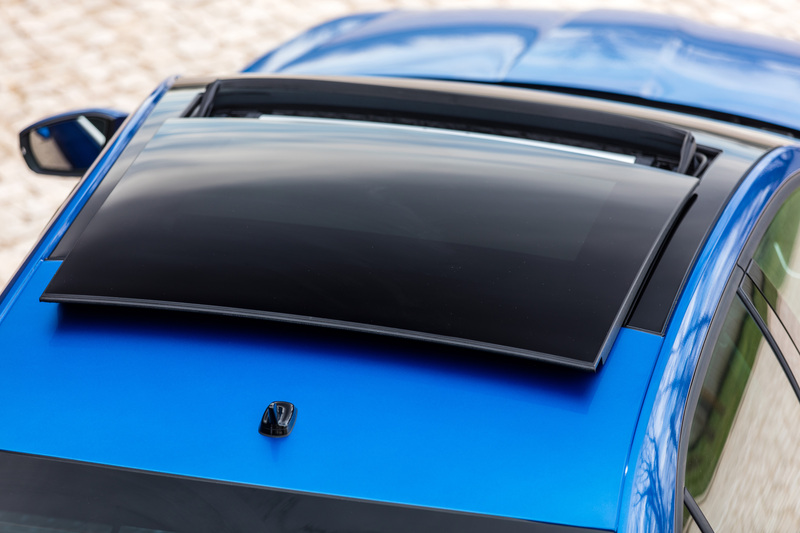 They bring the future of connectivity to the car with completely new functions. Thanks to ŠKODA Connect with the new mobile online services, passengers have the option of being ‘always online’. 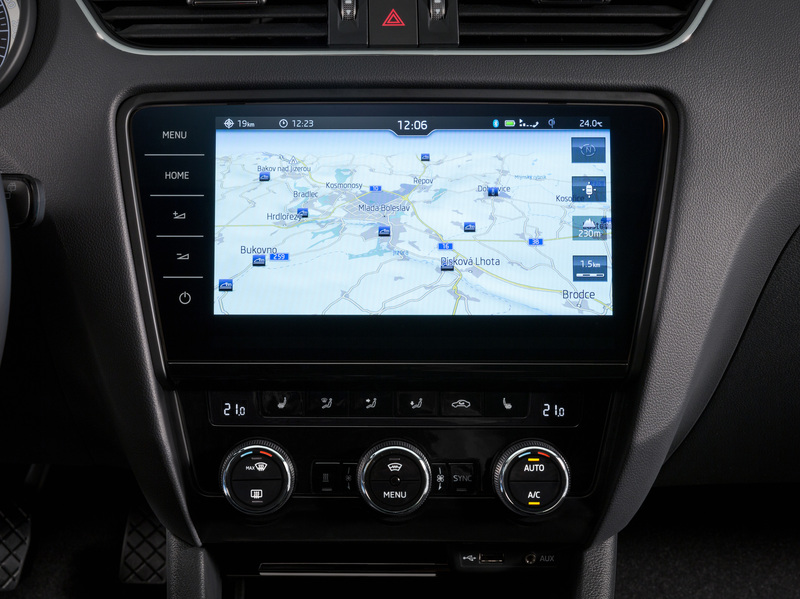 There is a choice of four hardware components: the Swing (standard) and Bolero sound systems, and the Amundsen and Columbus navigation infotainment systems. All four systems can be operated intuitively and impress with their fast operation and intelligent functions. The capacitive touchscreens, which come in a high-quality glass design in the Bolero, Amundsen and Columbus systems, react to the lightest touch. 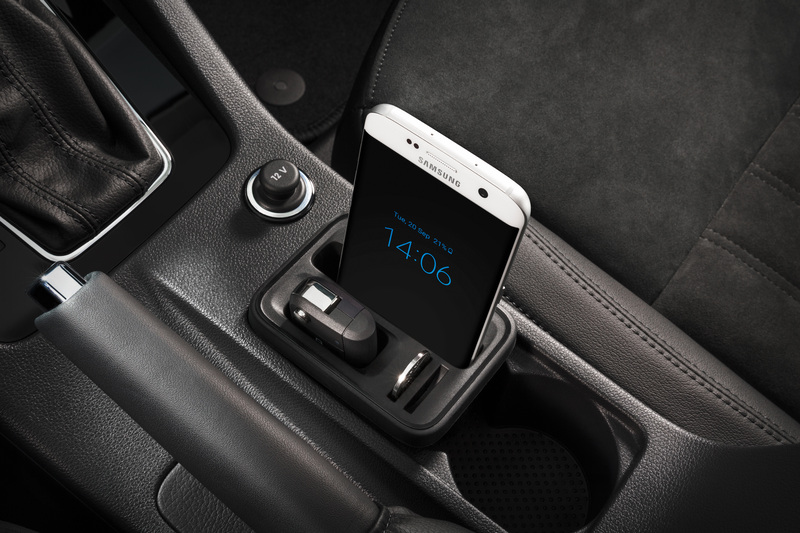 Their screen sizes are between 6.5 and 9.2 inches, depending on trim level. 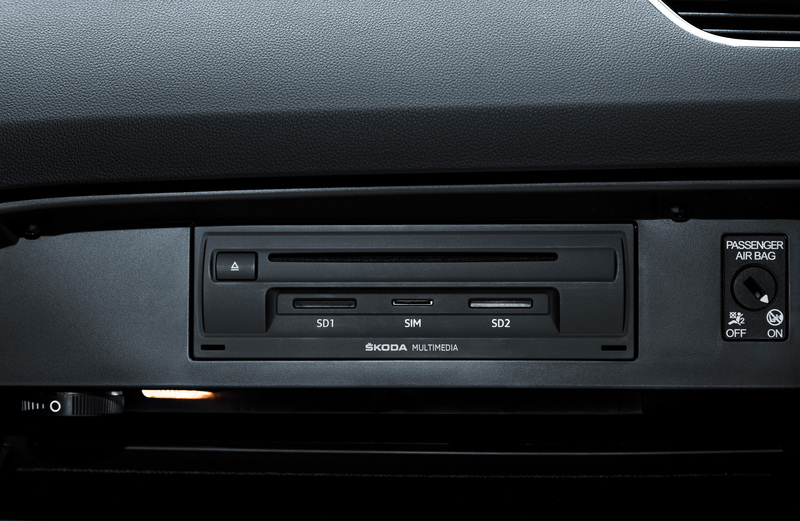 Even the standard Swing sound system is equipped with an SD-card slot, an aux-in and a USB port. 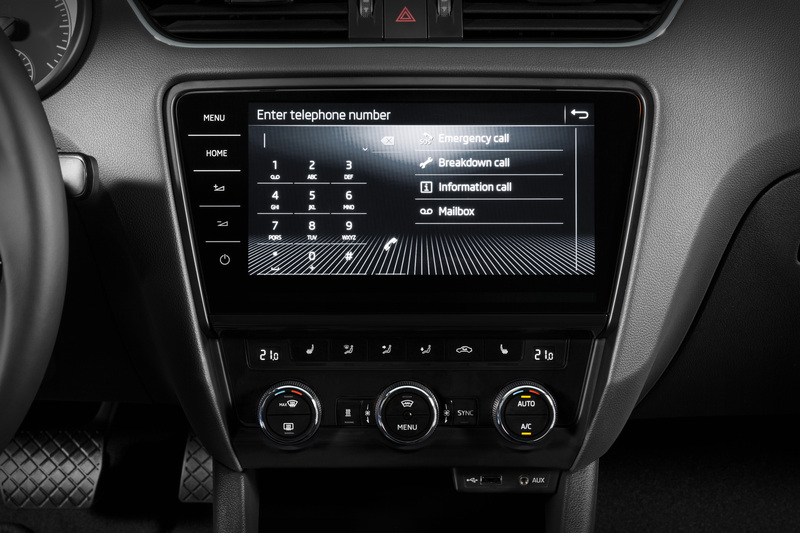 Other connectivity features are available as an option, ranging up to the SmartLink+ platform which integrates smartphone apps and brings Apple CarPlay, Android Auto, MirrorLink™ as well as SmartGate to the ŠKODA OCTAVIA and ŠKODA OCTAVIA COMBI. 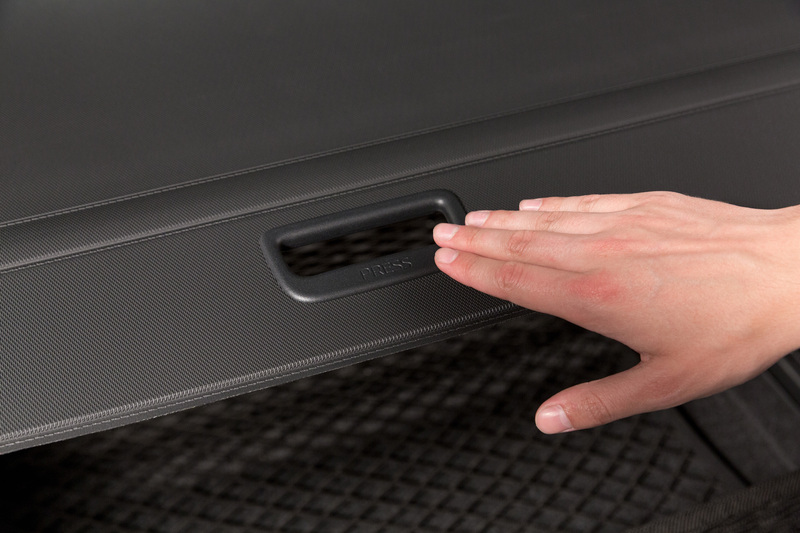 The Bolero sound system has a high-definition 8-inch touchscreen with proximity sensor technology. It can also read out text messages and enables them to be written on the display. The system also integrates a Bluetooth connection, eight speakers and SmartLink+. Voice control is available as an option. 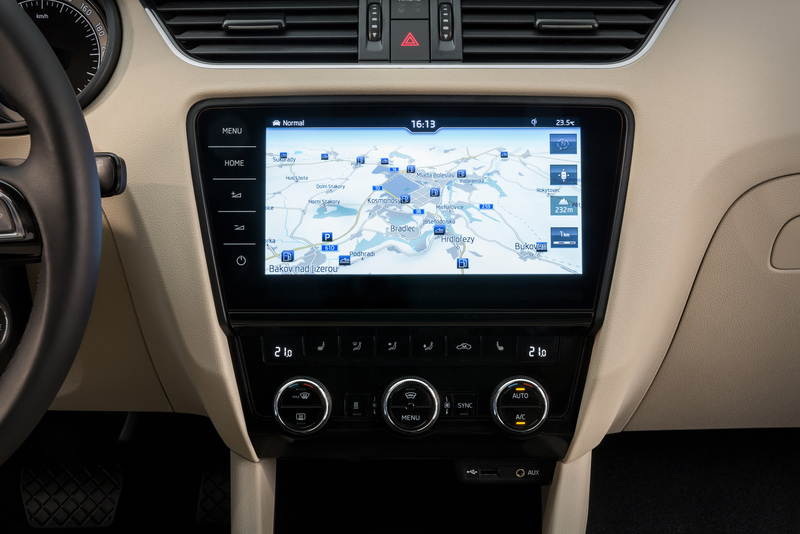 The Amundsen navigation system is based on the Bolero system. In addition, it comes with a built-in Wi-Fi hotspot that allows passengers to surf, stream and send emails using up to eight mobile devices. Maps for navigation can be updated during the device’s lifespan at no extra cost. 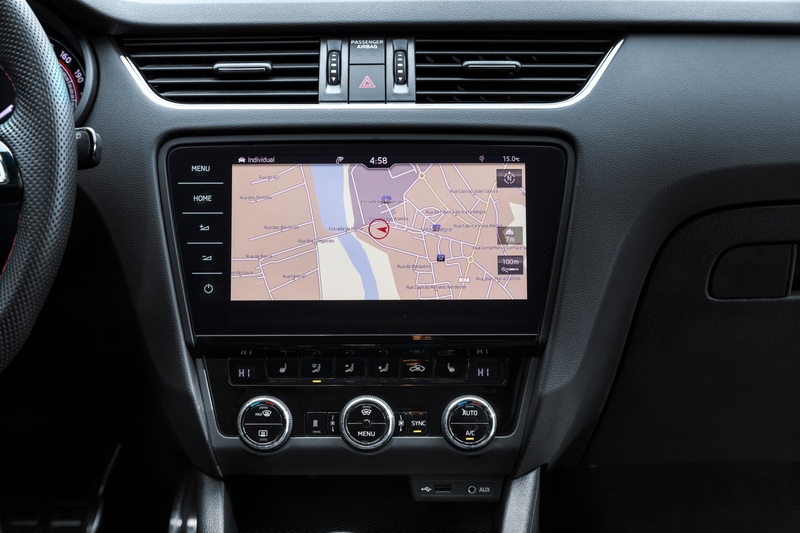 The Columbus navigation system is at the top of the range (available from the Ambition trim level upwards), with a 9.2-inch screen, 64-GB flash memory and optional LTE module for a high-speed internet connection. 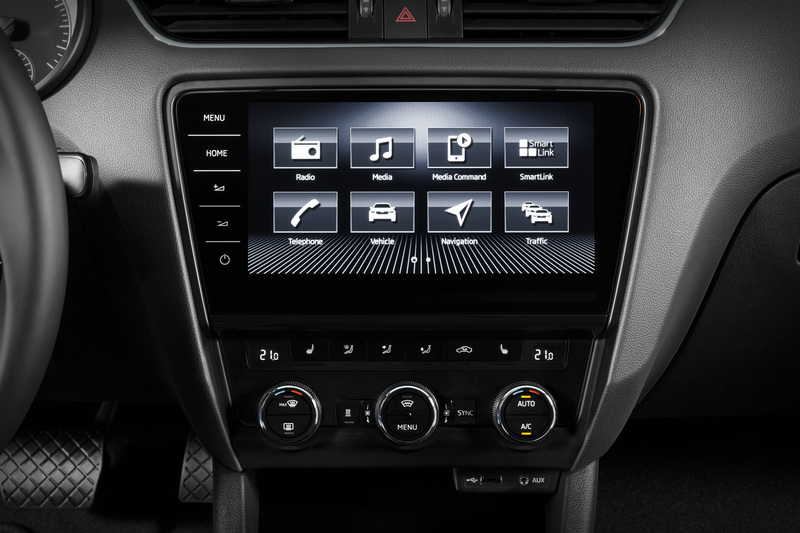 The ŠKODA Connect mobile online services are a perfect addition to the range of infotainment features. 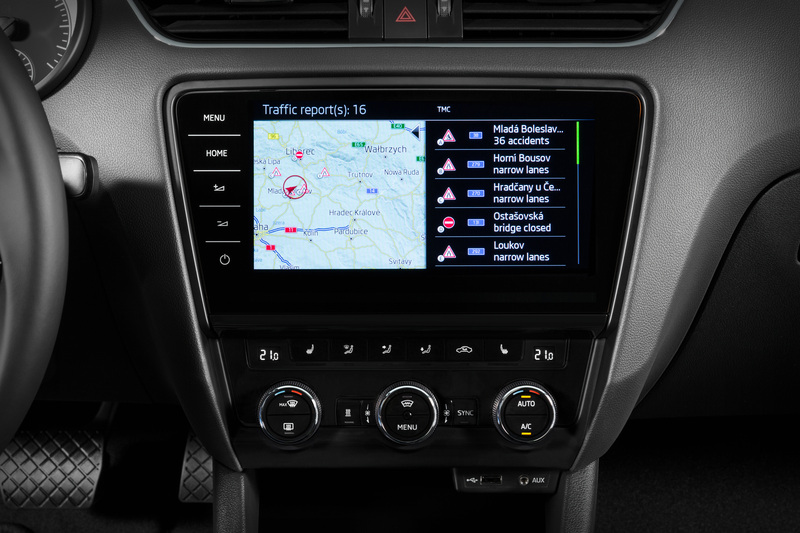 They are divided into two categories: the new Infotainment Online services provide information and entertainment whilst Care Connect services provide driver assistance and remote access to the vehicle. 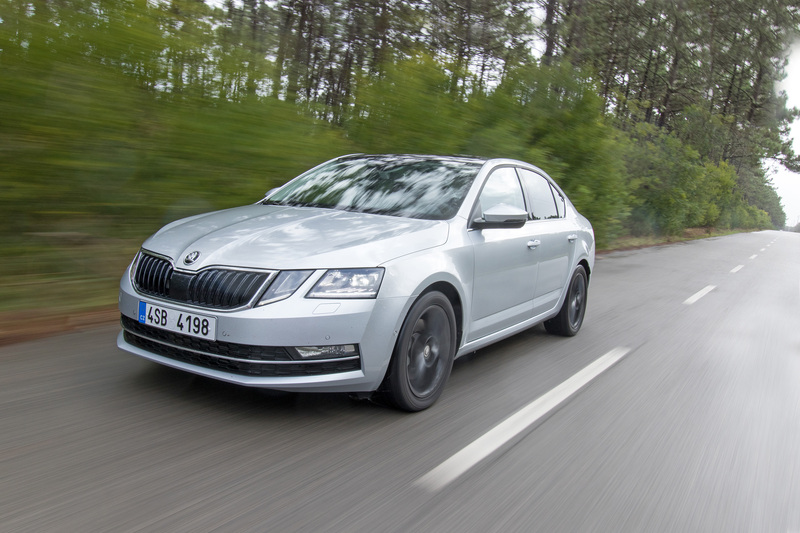 One highlight in the Infotainment Online portfolio is Online Traffic Information, which transfers live traffic on the chosen route to the ŠKODA OCTAVIA and suggests detours in the case of traffic jams. The Petrol Stations service lists petrol stations (including fuel prices) along the route. The Parking Spaces, News and Weather services provide the customer with customised information. 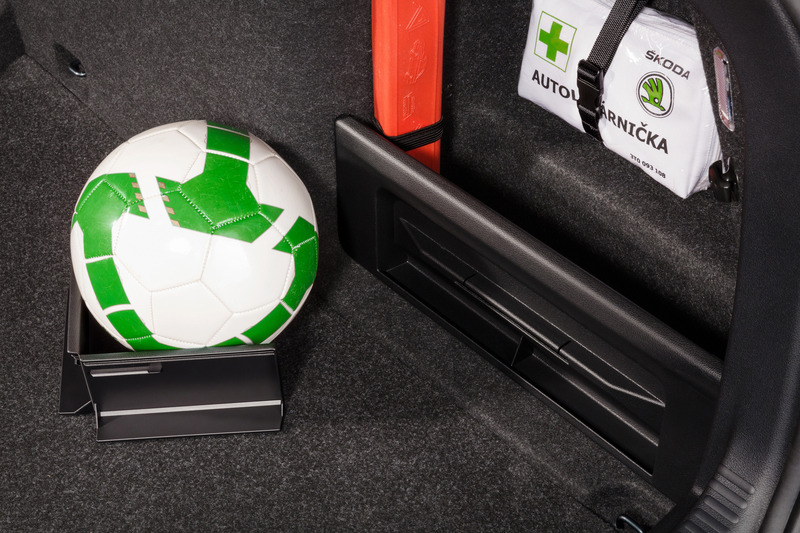 The Care Connect services support drivers of the upgraded ŠKODA OCTAVIA and ŠKODA OCTAVIA COMBI in many situations. Data is transferred via a SIM card that is permanently installed in the vehicle. The range includes automatic Emergency Call, which comes as standard in Europe from the Ambition trim level upwards (this may differ in some countries), Breakdown Call, which can, among other things, be used to organise assistance in the case of a breakdown, and the Proactive Service, which can be used to arrange and prepare for a vehicle service appointment. 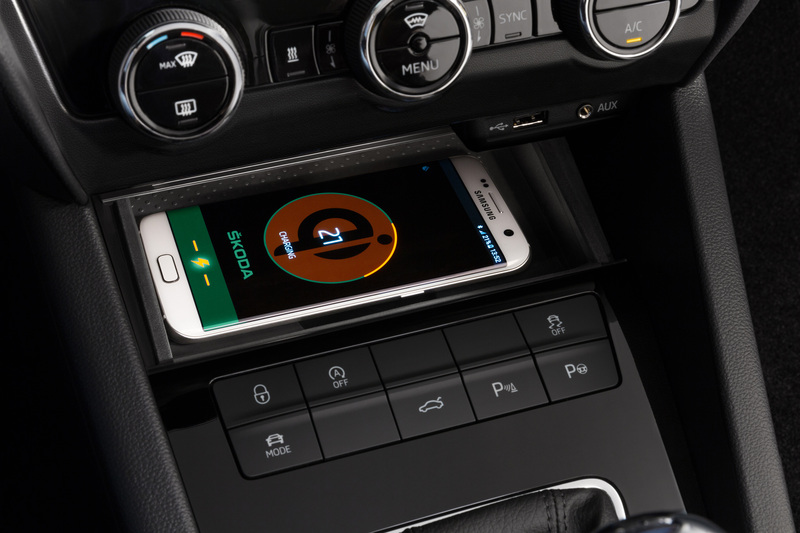 The driver can also remotely access information about whether the windows and doors are closed as well as the vehicle’s fuel level via the ŠKODA Connect app on their smartphone at any time. It is also possible to send navigation destinations to the car or have the vehicle’s current parking location displayed on your smartphone. 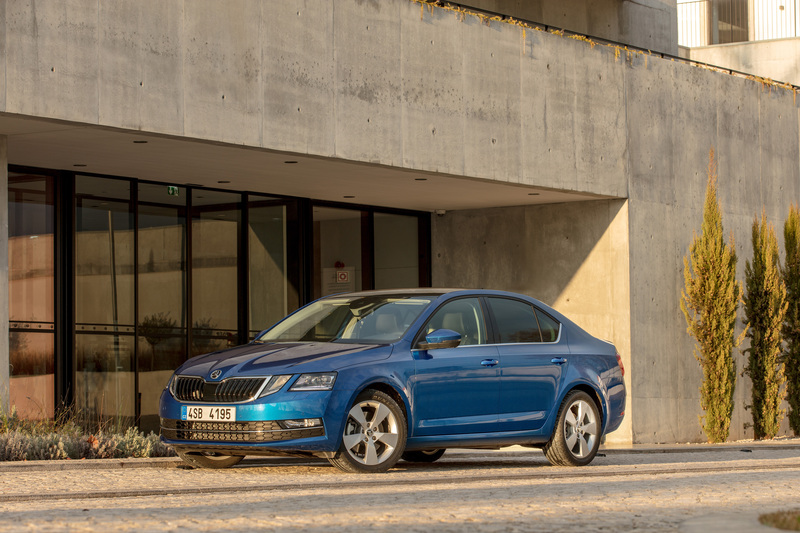 Practical features which increase comfort and everyday usefulness are part of the character of all ŠKODA models. 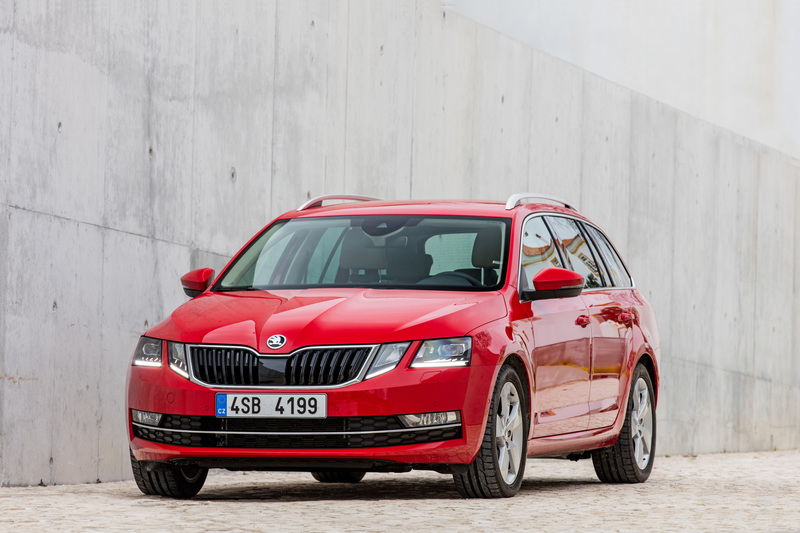 As part of the model upgrade, numerous additional ‘Simply Clever’ features have been implemented for the ŠKODA OCTAVIA and ŠKODA OCTAVIA COMBI. For example, there is a new bottle holder on board, the bottom of which is shaped in a way that allows PET bottles to be opened using one hand. 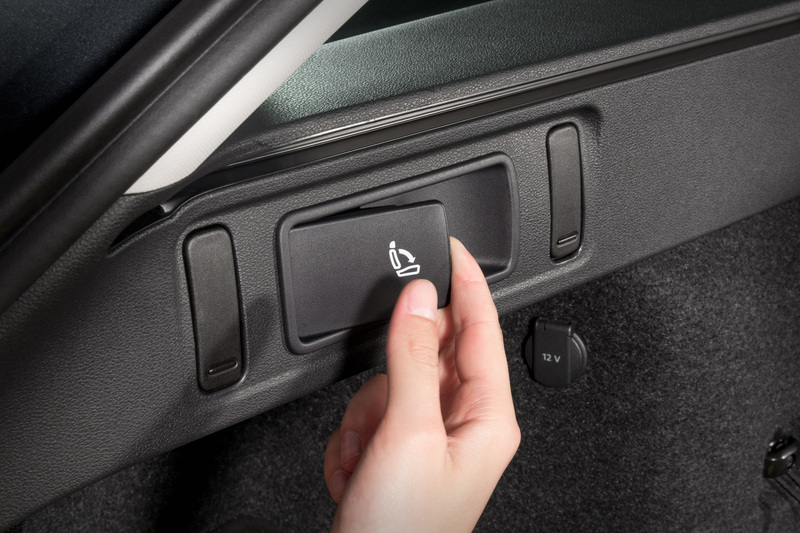 In addition, a heated steering wheel, two USB ports in the rear, folding tray tables on the backrests of the front seats and a personalisable key are available. 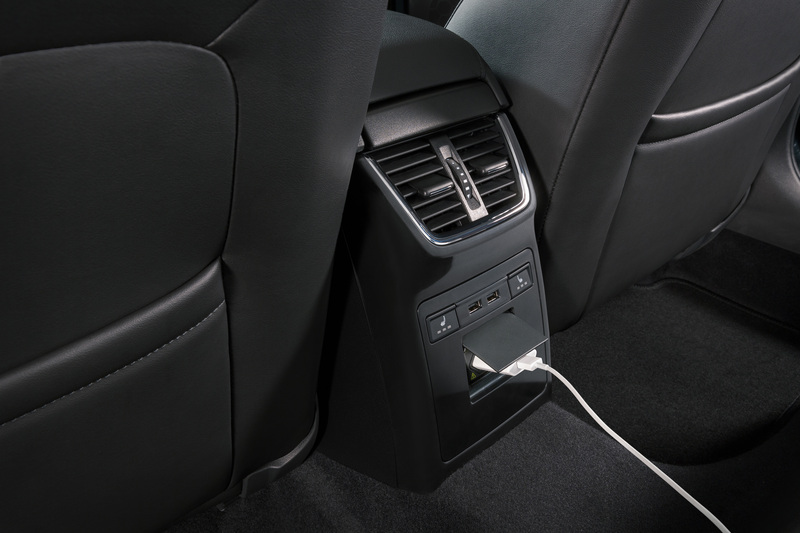 The boot of the ŠKODA OCTAVIA COMBI is also equipped with a removable torch, with a battery that recharges while driving.